Dental X-Ray Generator. The ability to accurately and inexpensively diagnose dental problems is rapidly becoming the standard of care in veterinary medicine. Very often, signs of illness are not apparent to the human eye but are revealed by x-rays. Early detection and treatment not only saves teeth, but sometimes saves lives! Vital Signs Monitor. There is no piece of electrical equipment that can ever truly take the place of a trained veterinary anesthesia assistant or technician! However, this piece of equipment helps its human counterpart by providing a continual, second-by-second report of the patient’s blood oxygen concentration, pulse rate, temperature, and blood pressure. It also provides, and can print, a steady tracing of the patient’s ECG, or electrocardiogram. 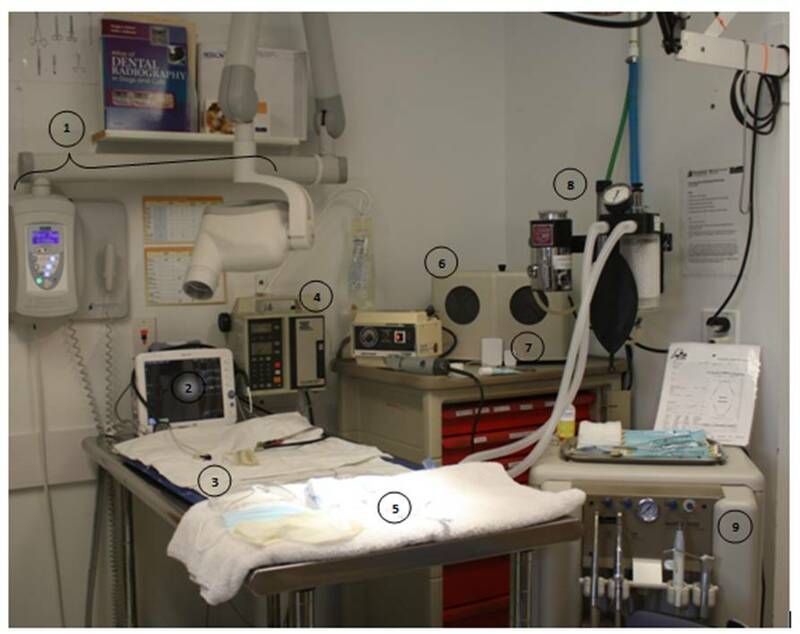 The combination of all these pieces of information allow monitoring of the patient’s well-being during anesthesia and helps with early identification of any problems that might develop. Circulating warm water pad. This important piece of equipment safely provides warmth to the patient. Unlike air-warming systems which are noisy and electric heating pads which can malfunction and cause severe burns, the silent circulating water pad’s heating element is not in contact with the patient. Electric and Battery powered Fluid Pump. This machine delivers intravenous fluids, at a rate calculated for each patient’s specific needs. Sometimes included in the intravenous fluids are such medications as pain management, antibiotics, anti-inflammatories, and anti-vomiting drugs. Dental radiograph processor which is a countertop device that allows the technician to develop dental x-ray films in a matter of minutes, enabling our doctor to diagnose any abnormalities in the tooth crown, tooth root, or surrounding bone and jaw. Dental Radiographic Film. This product is available in a variety of sizes. The size of the film chosen for each x-ray depends on the location of the tooth or teeth in question and the size of the pet. Interestingly, dental x-rays excel at showing other tiny areas that sometimes need radiographs, such as cat paws and joints, and dog toes and tails. The Anesthesia Machine is an integrated system which regulates the mixture of oxygen and inhalant anesthetic (we use the one called “isoflurane”) that is delivered to the patient. The quantity and rate of administration is altered to suit each individual patient and is adjusted frequently during the procedure. High Speed Air and Water Dental Delivery Station. This is a super-efficient mobile unit that includes four tools for dental care: a variable speed drill, a rotary polisher, an ultrasonic water delivery scaler, and an air/water drying/rinsing wand. These are the very tools that dental hygienists use when treating their human patients.